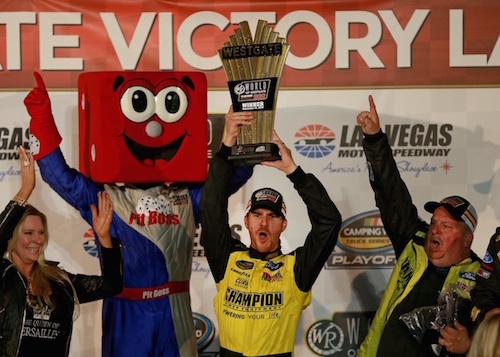 Grant Enfinger led a race-high 40 laps en route to his win of the World of Westgate 200 NASCAR Camping World Truck Series race at Las Vegas Motor Speedway on Friday night, a race that was scheduled for 134 laps but was extended by 10 extra laps by three overtimes. The Vegas race was the second race of the first three-race round of the 2018 Truck Series playoffs, so with the win, Enfinger joined Canadian Tire Motorsport Park race winner Justin Haley in having playoff survival secured beyond the opening round that will conclude next month at Talladega (Ala.) Superspeedway. GMS Racing and ThorSport Racing drivers combined to take the top-five positions in the finishing order, with GMS Racing drivers Johnny Sauter and Haley finishing second and third to ThorSport’s Enfinger. Enfinger’s teammates Ben Rhodes and Matt Crafton rounded out the top-five. Crafton and Rhodes’ top-five finishes came after starting the race in the back because of unapproved changes to their trucks before the race. Brett Moffitt was the race leader throughout the three overtime restarts, but on the final one, he ran out of fuel. He still managed to finish on the lead lap in 11th. The 11 caution flags that marred the race fell one yellow shy of matching the LVMS track record. Noah Gragson started on the pole and led the first 33 laps of the race, including winning the opening 30-lap stage of the race. By the checkered flag, though, he was in the back of the top-20 in 18th. Enfinger won the second stage that concluded on lap 60. Early in the stage, he battled Stewart Friesen for the lead, but on lap 50, Enfinger took over the top spot and maintained it for the remaining 10 laps of the second 30-lap stage. Enfinger was challenged by Friesen and Rhodes for the lead before lap 100, but Sauter took the lead just before a caution on lap 100. Sauter was challenged by Crafton for several laps before Moffitt took the race lead on lap 124. Friesen was involved in multiple late-race cautions and wound up with a 17th-place finish. Other top-10 finishers included Myatt Snider in sixth, Ross Chastain in seventh, Austin Theriault in eighth, Austin Wayne Self ninth, and Chris Eggleston in 10th.